INTRODUCING OUR EXCLUSIVE AMAZING ALL-IN-ONE WATER BOTTLE. Great for on the go to work outs, school, work, travel, etc.. Makes great detox water infusions. 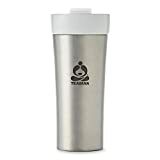 Capacity: 16.9oz (500 ml) BPA free with leak proof bamboo lid. DRINKING WATER BENEFITS US IN SO MANY WAYS, including digestion, water retention and liver and kidney function. Most of us should be drinking at least 8 glasses of water a day, yet we don't. Why? Because of the taste! Our water bottle is uniquely designed to make water taste great and help the environment because they are responsibly made and reusable. You can create your own natural and flavorful fruit infused water. Our reusable glass water bottle has a basket that holds flavor-infusing fruits such as lemons, cucumbers, strawberries, limes, watermelon, oranges, blueberries, and more so you can easily infuse your water to make your choice of flavorful waters that are full of vitamins and minerals. FOR LOOSE LEAF TEA USE - There are a array of loose leaf tea health benefits. Oolong, green, pu-erh, white and black tea all originate from one shrub. The Camellia sinensis, it is native to India and China. Tea has long been recognized for its positive effect on the mind, soul, and body. Much of that is due to the flavonoids, or antioxidants, found in the buds and stems. Our Tea bottle is a great way to get your daily health benefits on the go.. Reusable Glass Water Bottles not only helps reduce the amount of plastic bottles in our environment but taste better. With Plastic bottles if the water stays in there for a while, you can taste the plastic in it and metal bottles can leave a metallic taste in your mouth. OUR TEA INFUSER/WATER BOTTLE IS GUARANTEED TO STAND OUT FROM THE REST - Enjoy! This modern tumbler has a double-walled porcelain interior sheathed in stainless steel. It comes complete with an infuser for brewing your popular cup of tea at the office or on the go. Handwash only. 12oz. The NimaTea Tea Infuser Tumbler with Bamboo Lid is highly portable with a modern design, created specifically for tea lovers. Included with Protective Neoprene Sleeve and Extra Bottom Padding to cushion from any accidental shock or impact.Neoprene sleeve provides a firm grip and also acts as an additional insulated layer to keep your admired beverage warm or cold longer. Transform your tea and fruit infusion today! 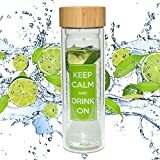 Thick Borosilicate glass offers durability that is heat resistant 100% food-safe parts that contain zero toxins Remarkable heat retention of the double wall vacuum glass body Ideal 15 oz capacity to enjoy a good amount of tea and fruit infused water Tumbler is easy to use, easy to clean, stain resistant and odor free Use with combination of the removable 2-in-1 multifunctional strainer and infuser basket for steeping loose tea leaves Perfect travel size portable tea maker on the go Neoprene sleeve and extra bottom padding protect tea infuser travel tumbler from any accidental damage Ideal for the health conscious and helps to instil a healthy drinking habit Package included: Borosilicate Glass Bottle (BPA and Lead Free) Food Grade Safe 304 Stainless Steel Infuser Height 3 inch Food Grade Safe 304 Stainless Steel Strainer Height 1 inch Bamboo Lid with Food Grade Safe polypropylene on the lid underside Amazon Buyers Trust Our NimaTea Brand for Quality Premium Tea Products and Accessories. Customer Satisfaction: If you are not completely satisfied, let us know and we will refund or replace your tea tumbler. Lead a Healthy Lifestyle, Enhance Your Tea Savory Experience. Get your NimaTea Tea Infuser Tumbler Today! Just click "Add to Cart" in the top right-hand corner now. Dust brush cleaner is a vacuum attachment that will collect dust from almost anywhere in your home or car, including places an ordinary vacuum nozzle won't reach. Due to the included universal adapter, this attachment can be used with most of vacuums, regardless of size or shape. With it, you'll be able to clean virtually every square inch of your home without worrying about moving tiny objects first, as the attachment will enable you to clean around them without sucking them up. Warnings : Please confirm your vacuum hose diameter before purchasing. Main features : ✔ Comes with a universal adapter so it fits any vacuum cleaner. ✔ Dozens of flexible, tiny suction tubes that can go nearly anywhere dust hides. ✔ Great for cleaning around fragile objects. ✔ Dust around tiny objects without removing them first. ✔ Get dust out of every nook and cranny. ✔ Get rid of all the dust you couldn't reach before Great for vents, keyboards, drawers. How to Use : 1.Plug into universal adapter that has come with it. 2.Attach to vacuum attachment on your vacuum cleaner. 3.Begin to clean anything with dust and enjoy it. 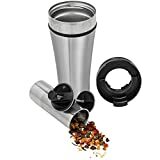 Tea Infuser Mug - 16oz Travel Tumbler - Store or Steep Tea Inside - Brushed Steel - We're tumbling head over heels in love with this NEW tea infuser mug from Planetary Design - an infuser mug / tumbler mug designed specifically for the tea lover. A truly ingenious design for loose-leaf tea infusion that completely stops the infusion once pressed. Patent-pending technology and a super-fine mesh filter basket create an incredibly clean brew AND once pressed, completely stops any additional infusion preventing over-steeping and the ensuing bitter tea. The 18/8 restaurant-grade stainless steel, double-walled, vacuum insulation is very durable and keeps your tea hot for hours. The screw-in lid and flip-top cap make spilling your tea virtually impossible and the whole unit is very easy to use. It is adept for any tea lover that is always on the go! Our Classic 14oz Libre Tea Infuser is our most popular size, and you'll understand why when you use it! 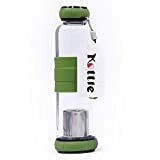 This model features a clean glass interior, durable BPA-free poly exterior, and removable stainless steel filter, and can be used for all beverages, hot and cold. Many customers tell us they keep it with them for maximum hydration all day long. Stay hydrated in style, no matter where life takes you! Your new Nuviem Tea Infuser is the superlative bamboo and glass tea bottle for on-the-go or at home! Do you like drinking tea and fruit infused water when you travel? Check this out. Why Nuviem Bamboo Tea Infuser is your number one choice over other tumblers: • Glass Vacuum Insulation • Multiple Lids for all of your needs • Bamboo parts • Sleeve for extra insulation Eco Friendly The elegant eco-friendly design of your Nuviem water bottle will make you fall in love with it. Enjoy the look and feel of hand crafted Bamboo. Multiple Uses Iced tea, detox water, fruit-infused water, or even smoothies, you can enjoy anything in your Nuviem water bottle! Made of glass, it doesn't alter the flavor of your tea or juice when you drink it as plastic bottles can. Enjoy pure refreshing taste every time, just the way you love it! Intelligent design The removable metal basket locks loose tea in place ensuring that the tea leaves don't mix in your drink. It's not only easy to use but easy to clean as well. 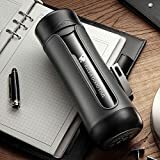 Its double glass wall construction and black neoprene sleeve with handle loop help preserve the right temperature inside for a longer period of time. Also, the glass body is dishwasher and microwave safe. Anytime, Anywhere The perfect size of your Nuviem water bottler makes it easy to carry. The unique design of the product includes an extra flip-top lid so that you can enjoy your drink absolutely anywhere at anytime; be it in yoga class or on your way to office or out there somewhere in the wild. Money-back guarantee If you are not fully satisfied with your Nuviem water bottle, return it within 30 days of purchase and claim a 100% refund! Order today and change the way you drink forever! Scroll up and Click Add to Cart!